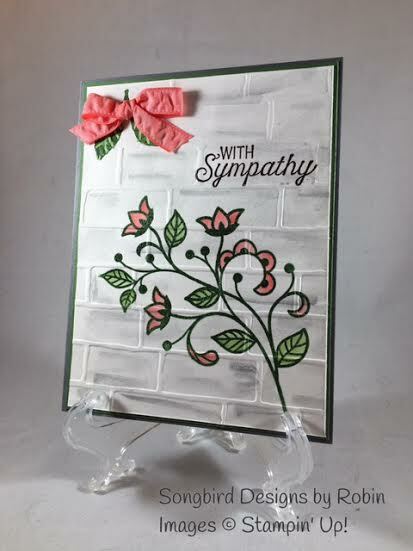 My color scheme for this card is Garden Green, Basic Gray, and Flirty Flamingo. The stamp set I used was Flourishing Phrases. I used a watercolor wash for the background and then stamped and embossed the flourish, leaves, and sentiment. I then ran the piece through the Big Shot with the Brick Wall Textured Embossing Folder. After dry embossing, I added more gray watercolor to highlight the bricks. I finished my card with a Flirty Flamingo Bow. I hope you like this extra post today. Please leave me a comment and let me know what you think. 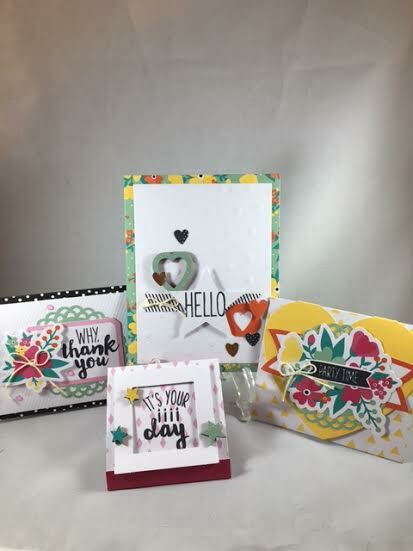 There is nothing like forming new friendships through stamping! 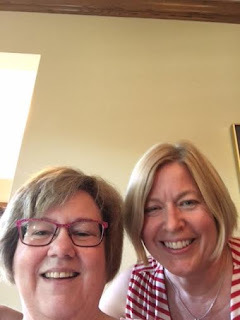 Beth McCullough and I are both Stampin' Up! Demonstrators who had formed a Facebook friendship, but had never met. 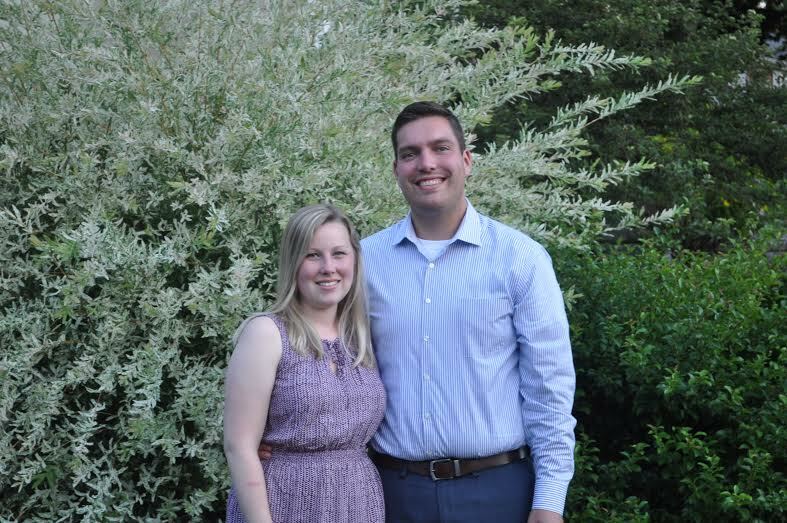 While I was in Iowa, she invited me to stamp at her welcoming home. It was like we had known each other for years even though we had never met! Today's card is a special thank you to Beth for being such a gracious hostess. I hope she doesn't see this post, but if she does there's another surprise coming her way in the mail! My color scheme is Sweet Sugarplum, White and Black. The stamp sets I used were Touches of Texture and Labeler Alphabet. The white doily is leftover from the Oh Happy Day Card Kit. Beth and I took time to take a quick selfie before I left to go home. Thanks Beth, for a fun day! I'm back today with another Sunshine Saying and Sunshine Wishes card. This card is for two very special people my daughter, Emily and her husband Sal. 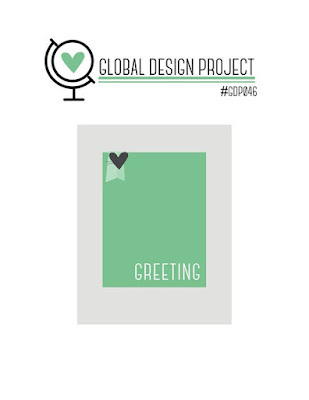 The card base and green rectangle are Pear Pizzazz. The paper is from the Designer Series Pastel Paper Stack. The heart and "congrats" die cuts are cut with the Sunshine Wishes Dies. 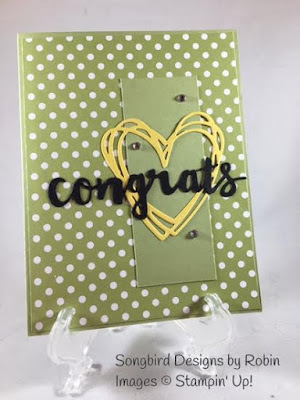 The heart is done in Daffodil Yellow and the "congrats" is Basic Black. I added three rhinestones for a touch of bling. I wish them all the best as they celebrate their fifth wedding anniversary! My card today is for a co-worker who has decided to become a stay-at-home mom. She is the mother of two darling little girls and hated being away from them. 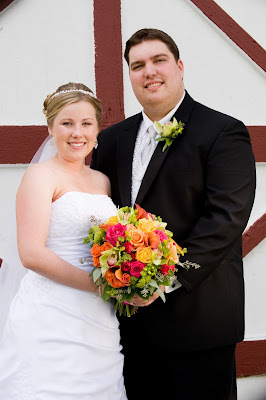 She has been debating this move for awhile and I am so happy for her. Can you guess which colors they are? If you guessed the ones below, you have a good eye. I used two stamp sets today. 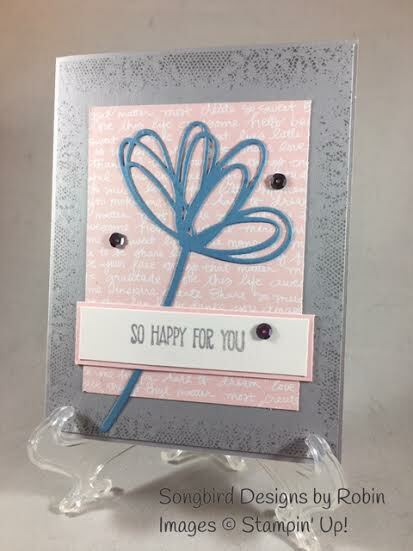 The Smoky Slate background is stamped with a texture stamp from Touches of Texture. The greeting is from the Sunshine Sayings Stamp Set. I chose the Pink Pirouette DSP (Designer Series Paper) is from the Subtles Designer Series Paper Stack. 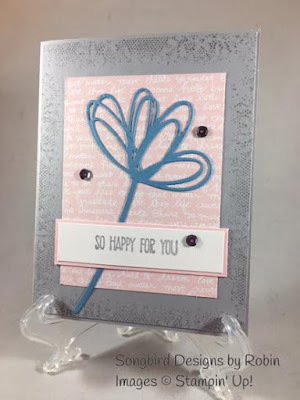 The Marina Mist flower is cut using a die from the Sunshine Wishes Dies. For a little bling, I adhered three sequins in a loose triangle. I'm sure my friend will be pleased with this sweet card. What do you think? While my hubby and I were in Texas, we visited the Alamo. 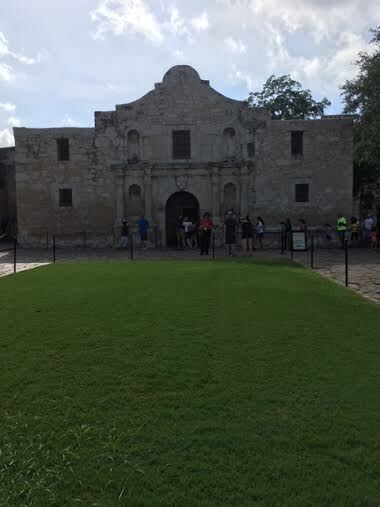 I loved the Spanish/Mexican influence in the city of San Antonio and the Alamo itself. I'm interested in the cultural aspects of the time period. My husband, Steve was into the actual battle history. I saw some beautiful blue pieces in the Alamo museum that inspired my card for the today. The beautiful paper is from the Moroccan Designer Series Paper Pack. I love the Dapper Denim and Marina Mist triangles! The stamp set is Heartfelt Sympathy. This set doesn't need much embellishing to go with it because it's very pretty on its own. I stamped the saying on Very Vanilla paper with Dapper Denim ink. I mounted the sentiment on a piece of Marina Mist. For embellishments, I used Dapper Denim Ruched Ribbon tied in a knot. I also added the leaves cut with a thinlet from the Flourishing Thinlets Dies in Marina Mist? 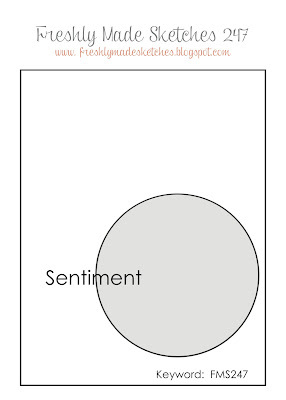 If you need a quick sympathy or thinking of you card, this card is for you. It took me ten minutes to put it together! Aren't these cards so bright and cheery? The kit comes with supplies for 20 cards like the ones above. EVERYTHING that you need for this kit is included. 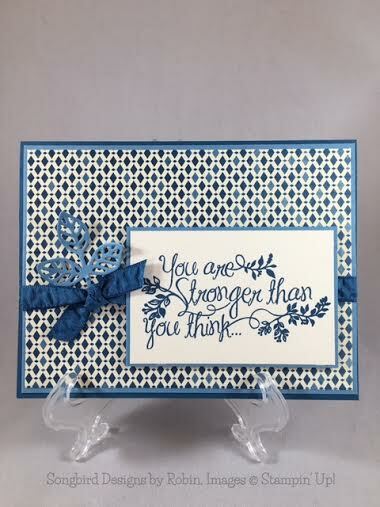 Cards, embellishments, stamps, ink and even a clear stamping block is there. All you need to supply is adhesive! You can follow the directions or you can take off and do your own thing. I arrived home yesterday after a three-week trip to visit relatives. I had great fun, but it feels so good to be back home. I wasn't able to blog while I was away because my dad has no Wifi. I felt like I was back in the stone ages! I'll be sharing pictures and stories from my vacation the next couple of weeks. I'm going to let them inspire my projects. 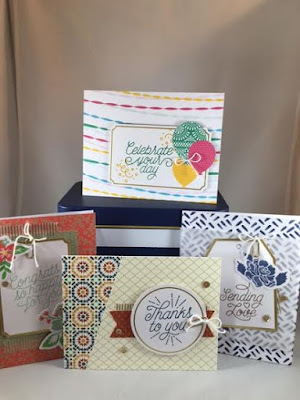 I couldn't go the whole time without stamping so I took along two card kits that can be found in the 2016 catalog. Here's a picture of one of the cards I made from a kit. These cards are from the Designer Tin of Cards Kit. This kit was such a big hit in the last catalog that Stampin' Up! released a new one! The kit has supplies to make four of each of the designs above. You purchase the kit, coordinating stamp set, and the ink pads (if you don't have them already). It was perfect to take on vacation! 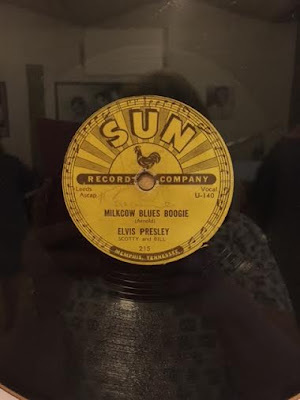 Here's a pic from our trip to Sund Studios in Memphis, Tennessee. 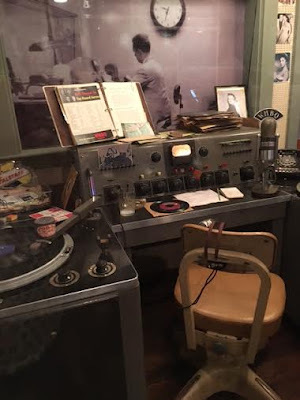 Elvis, Jerry Lee Lewis, and Johnny Cash got their start at this recording studio. I love the name of the song on this record! Hello! While I've been off on vacation, Stampin' Up! has started a new promotion! What a deal! 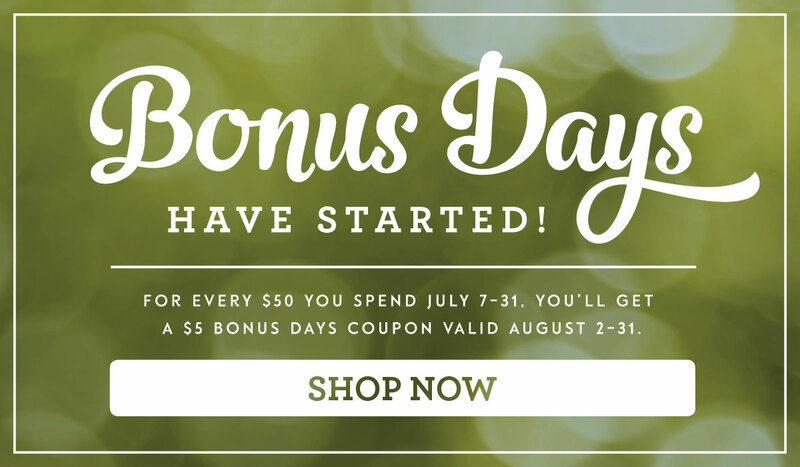 For every $50 you spend* between July 7 and July 31, you’ll get a $5 Bonus Days coupon that you can use between August 2–31, 2016. 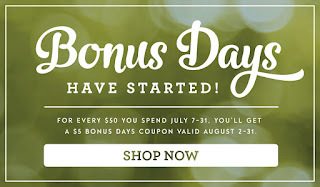 This is a great opportunity for you to get items from your wish list, whether you buy them now or with your coupons in August. Stampin' Up! has never offered a promotion like this, so you definitely want to take advantage of it!